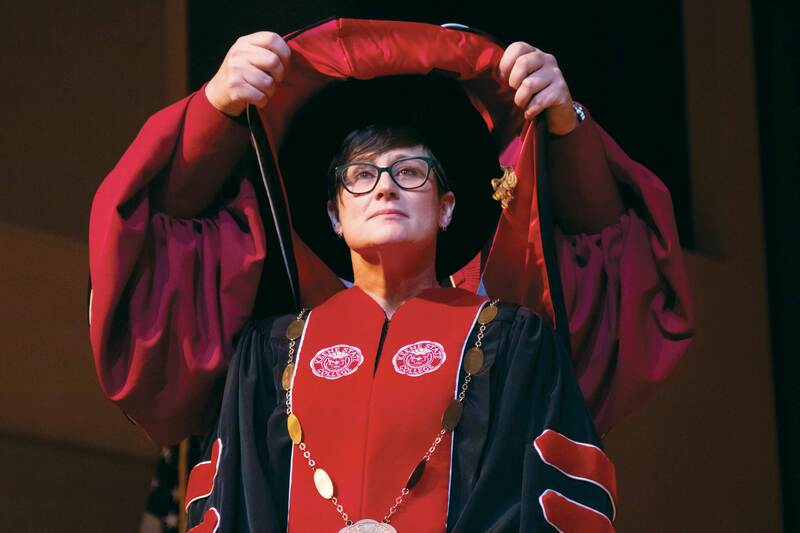 On Friday, April 5, Melinda Treadwell was officially inaugurated as the eleventh President of Keene State College. The inauguration ceremony was held in the Mabel Brown Room in the Student Center. College officials and faculty, alumni, community members, business leaders, Keene city officials, students and many more were in attendance. The Inauguration celebration, however, started earlier. On Thursday, April 4 from 5-7 p.m. in Norma Walker Hall, the Keene Chamber of Commerce hosted a “business after hours” event to let local business leaders meet and get to know the soon-to-be President of KSC. Chamber President Phil Suter said it is a great opportunity for individuals to see the commitment to a lasting relationship between the college and the city. The ceremony began the next day with the procession of KSC officials, student government members and Treadwell at the end. Chancellor of the University System of New Hampshire Todd Leach was the first to give a speech during the ceremony. Keene mayor Kendall Lane also spoke on Treadwell’s willingness to bridge a connection between the College and the community. 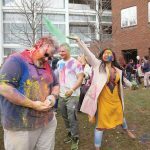 “Through her efforts over the years she has shown that being an active, supportive member of our community is of great importance to her personally and it is clear this philosophy extends throughout the college as a whole and most importantly it is felt amongst the student body,” Lane said. KSC officials who also spoke on Treadwell’s competency and readiness for this position included Associate Vice President for Diversity and Inclusion Dottie Morris, Director of Cohen Center for Holocaust and Genocide Studies Hank Knight, Director of Campus Life Jennifer Ferrell and President of the Alumni Association Scott Kuhnly. “We (KSC staff) recognize her as an authentic, dedicated, enthusiastic and intelligent leader. A sense of renewed energy, optimism and inspiration is alive on campus and you can feel it in today’s celebrations,” Ferrell said. Student Body President Sarah Dugas also spoke during the ceremony on behalf of KSC students. Treadwell included many hopes and plans for the future of KSC in her inaugural address after extending her thanks to her colleagues and family for their support. She also cited concerning statistics regarding how Cheshire County falls behind the rest of New Hampshire. Cheshire County’s median income is 14.8 percent lower than the state average, total employment has dropped half a percentage year after year while it has grown by 2.3 percent statewide and Cheshire County’s poverty rate is 18 percent higher than the state average. Treadwell stressed that KSC will be a partner and a resource to this region when it comes to battling these issues. Specifically, Treadwell also discussed the advancing of the Cohen Center and the Holocaust and Genocide Studies program. KSC’s commitment to sustainability, the zero waste goal and reduction of our carbon footprint were also included. Treadwell also plans on co-locating with community colleges to increase student access. Product design and an optics programs will also be moving forward in the future. The advancement of the quality of the music and performing arts programs to make KSC a cultural hub is another goal. 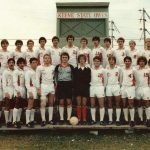 Public health, substance abuse and mental health challenges are also at the forefront of concerns for the college. KSC’s acapella group Chock Full O’Notes also performed multiple times during the ceremony: The national anthem, an original song for Treadwell and the closing song for the ceremony. Treadwell closed her inaugural address with the introduction of a new KSC tradition. The President’s medallions will be given out the day of commencement as gifts to graduating seniors. Treadwell and the student government worked on the design of the medallion for the last few months.